Bipolar RF Ablators for arthroscopy use radio frequency power to generate arcing through bubbles formed between an active electrode and tissue with the tissue being vaporized by the arcing. These devices provide for the resection and ablation (bulk vaporization) of soft tissue as well as the coagulation of blood vessels. To date, bipolar ablation devices have required dedicated generators that produce power levels well beyond the capability of most standard general purpose generators. High power levels are needed to “ignite” the ablators due to their inefficient design. Unfortunately, these high power levels may cause a significant rise in intraarticular saline temperature with an associated increase in the likelihood of thermal injury. Additionally, when using some of these devices, arcing (sparking) may occur between the active electrode and the return electrode due to the high power required for the forming of bubbles at the active electrode and the initiation of an ablative discharge. The high efficiency Velocity Orthopedics Velox™ Ablator is the first to address the efficiency/power differential with its proprietary Velox™ Advanced Power Technology (APT). 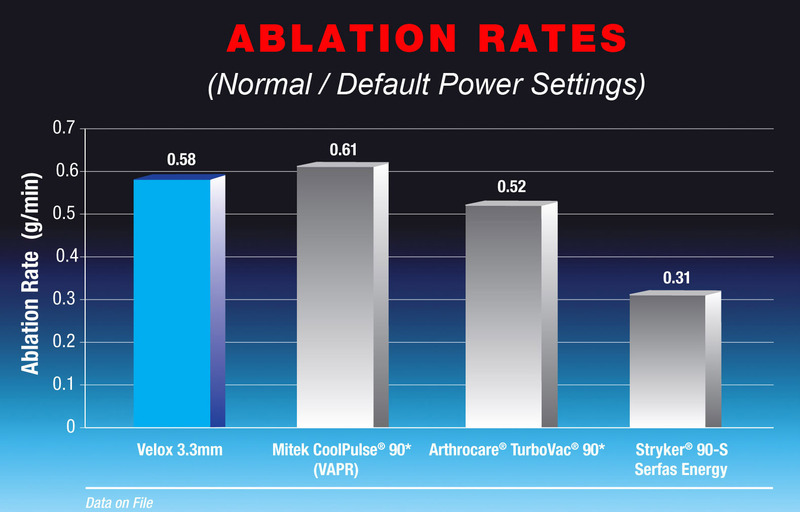 The dramatic increase in efficiency allows the Velox™ Arthroscopy Ablator to operate at lower power levels than comparable ablators, achieving aggressive ablation quickly with reduced potential for thermal injury to the patient. 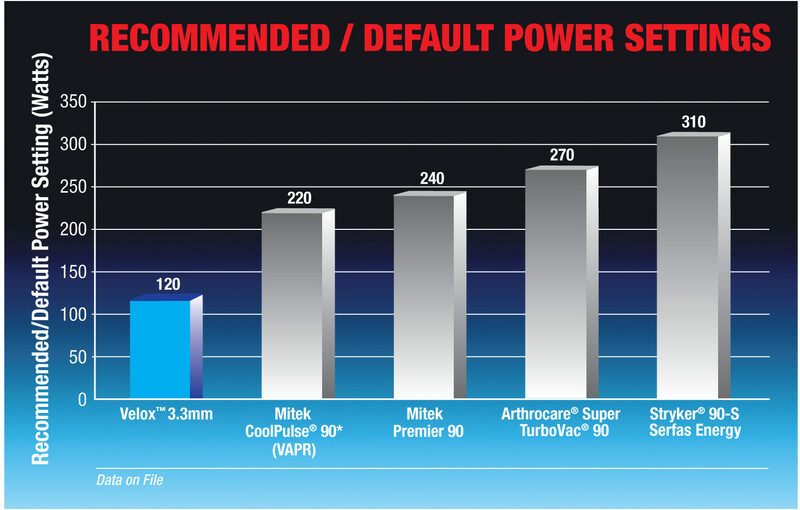 The reduced power requirement allows use of a standard generator already available in every surgery center or hospital OR, thus eliminating the need for investment in new capital equipment. Importantly, the power to the Velocity Velox™ RF Ablator is limited to a lower level if the appropriate tissue interface is not present and the probe is not firing. This is in contrast to other RF ablation systems which dramatically increase power when the probe is in this “pre-ablation” mode and is attempting to ignite. When energized but not firing, as may happen on a bony surface, other systems supply the probe with very high power levels which may increase the likelihood of thermal injury. 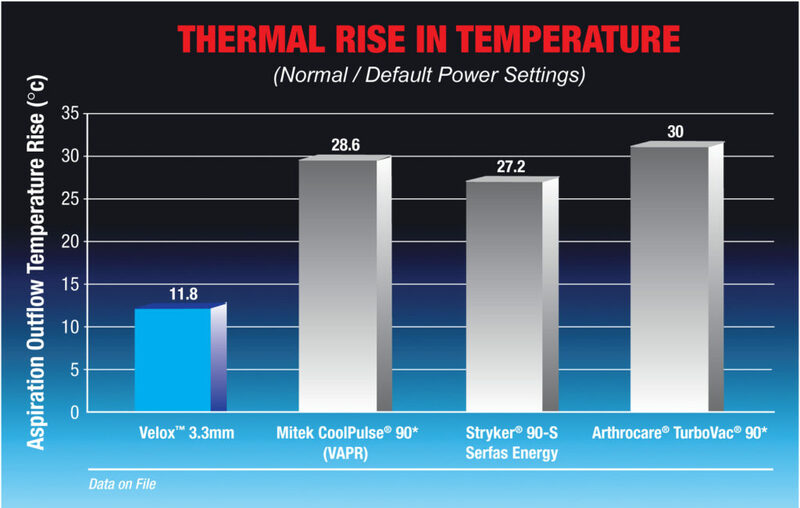 The Velox™ ablators with their reduced power in the pre-ablation mode cause less temperature rise.